Every year on the first Friday in February, thousands of our nation’s dentists and their dental team members provide free dental care services to uninsured children Kindergarten to 8th grade. The program is called Give Kids a Smile. It is happening Feb 5, 2010. Find a program in your area. 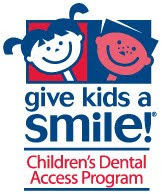 I was just going through my google reader and noticed a post at freebieblogger about Give Kids A Smile. It is a program put on by the American Dental Association all around the country. On Feb 6th dentist’s, dental hygienists, dental assistants and even some office staff will be donating there time and resources to offer free dental care for children in low income families. I am not sure what it takes to qualify but I know that I will be working on lots of kids whose parents recently lost their jobs and no longer have insurance. I have participated in the event a couple of times over the years, so it was funny to read about it somewhere else. I did not realize it was a nation wide event. Anyway if you or someone you know is in need of this service click here to get info for your area.